* Because Eq. (G-10) is a homogeneous equation in P, it does not define the normalization of P-Equations (G-ll) and (G-13) define the conventional Neumann normalization, but other normalizations are used (see Appendix H or Chapman and Bartels ). where 8* is the Kronecker delta. where J„ = Cn0. Terms for which wi = 0 are called zonal harmonics and the J„ are zonal harmonic coefficients. Nonzero m terms are called tesseral harmonics or. for the particular case of n = m, sectoral harmonics. P6(cos0). The tesseral and sectoral harmonics have n-m zeros for 0" <0< 180°, and 2m zeros for 0° <$<360°. Figure G-2, the representation of P63(cos0)cos3<f>, illustrates the division of the sphere into alternating positive and negative tesserae. Hie word "tessera" is Latin for tiles, such as would be used iri^a mosaic. When n = m, the tesseral pattern reduces to the "sector" pattern in Fig. G-3. For a more detailed discussion of spherical harmonics, see Hobson . 1. Arfken, G., Mathematical Methods for Physicists. New York: Academic Press, Inc., 1970. 2. Chapman, Sydney, and Julius Bartels, Geomagnetism. Oxford: Clarendon Press, pp. 609-611, 1940. 3. Fitzpatrick, P. M., Principles of Celestial Mechanics. New York: Academic Press, Inc., 1970. 4. 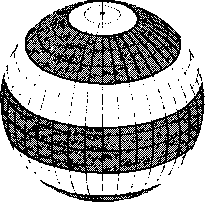 Hieskanen, W., and H. Moritz, Physical Geodesy. San Francisco: W. H. Freeman, 1967. 5. 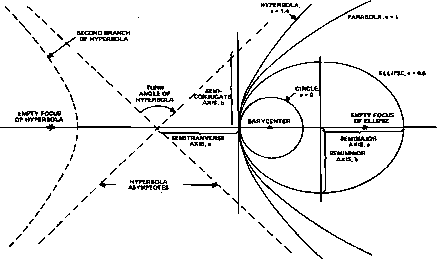 Hobson, E. W., The Theory of Spherical and Ellipsoidal Harmonics. New York: Chelsea Publishing Co., 1931. 6. Jackson, John David, Classical Electrodynamics. New York: John Wiley & Sons, Inc., 1962. 7. Yevtushenko, G., et al., Motion of Artificial Satellites in the Earth's Gravitational Field, NASA, TTF-539, June 1969.